It’s been a little too long since my last post. I’ve been on the move, without internet, and mad at my $250 Acer netbook purchased from Costco. This little computer literally has a mind of its own. Sometimes we get along and sometimes we don’t. Things got really bad between us in Barcelona, but I think the Acer prefers the cooler fall weather were experiencing here in London. Yes, I know, the last post was about Spain—which is a long way from London—so I’m going to have to do some backtracking. A work friend and the Shift blog’s unofficial IT consultant, Rob McGarty, gave me a few blogging pointers before I left Seattle. His main suggestion to me was that I keep my blog posts short and timely. This post isn’t going to be short or timely, Rob—but you are going to be in the lime light. Rob and I worked together very intensely on a project for a few months and I quickly learned that biking and his two young kids were his favorite topics. You learn a lot about the people you work with even if you don’t ever spend time with them outside of the office. Unlike school where everyone is in the same season of life, work friendships provide windows into how life is at many different stages. Many of my co-workers provided glimpses for me of what life with kids was like. Rob and I once discussed what school his son had been assigned to for kindergarten and how much time parents can spend getting their kids to and from the places they need to be. He mentioned that he and his wife bought a cargo bike—similar to the models I’ve showed from Amsterdam—so that they could have some fun biking while they were ferrying their kids around, but that the new bike wasn’t working out so well for them. They live on Phinney Ridge and apparently when his wife took the bike out for the first time the kids had to help push the cargo bike back up one of the steeper hills to their house because it was too heavy for her to pedal it all the way to the top. I don’t blame her. Seattle, like Zürich, has really steep hills. Zürich may even have some steeper hills—there are a few within the city that are 15 percent grade climbs and when I went up them I was glad not to be carrying all my gear, much less two small people. Hills can be a real buzz kill. They make you sweat more, they can be serious mental barriers, and they make carrying cargo difficult. There is a simple solution to the hill problem, however, I want to preface my praises of electric assist bicycles (e-bikes) with a few of the reasons I like getting up hills the old-fashioned way. Satisfaction. The bigger the hill the more satisfied you will feel when you get to the top and get to go down. Hills can be like mood rings. Your approach to a hill may vary depending on your mood. If I was pumped up about something after work I would sometimes get out of the saddle and attack hills. If I was biking home after being out late on a Friday or Saturday with friends I would sometimes meander tiredly up the hills, creating my own switchbacks on the deserted side streets near my apartment. 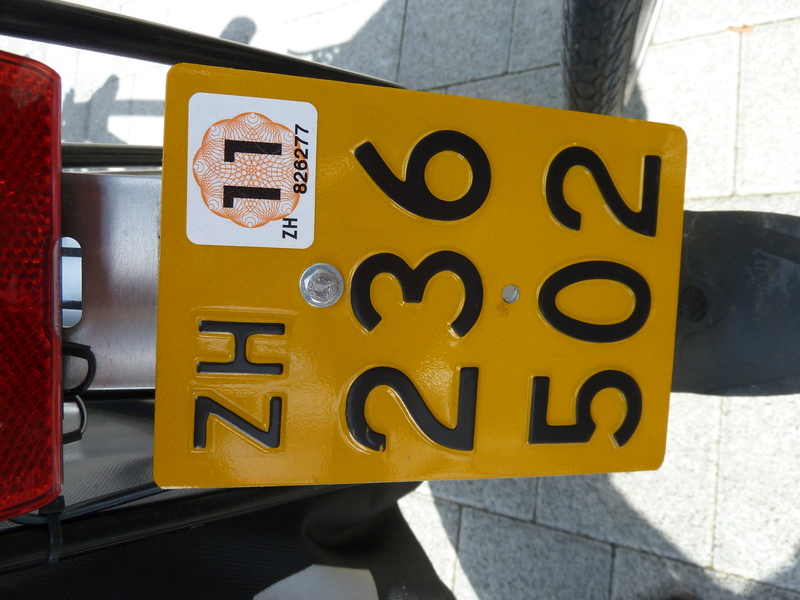 While I’ve been touring with full panniers I generally have a steady, one-inch-at-a-time attitude towards hills. How you approach a hill is perhaps a good barometer for how you will approach other challenges throughout the day. You don’t have to pay for spin classes. Going up hills is good, free exercise. Sometimes hills are annoying though—especially if you are a senior citizen biker, a parent carrying kids around, or a professional trying to arrive for a meeting on time without being drenched in sweat. I’d heard a lot about electric assist bikes, but I wanted to learn more—and I wanted to try one out! 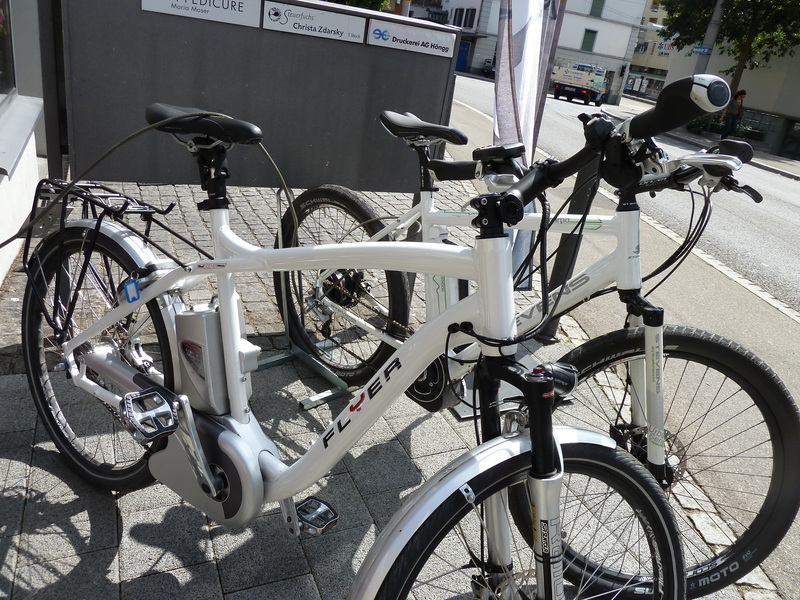 So, I went to a bike shop in Zürich called 2Rad that specializes in electric assist bikes. The owner of 2Rad, Lucas, generously offered to let me test out a few e-bikes and said he would answer any and all of my questions about e-bikes over lunch. Lucas putting the battery in the Stevens e-bike. 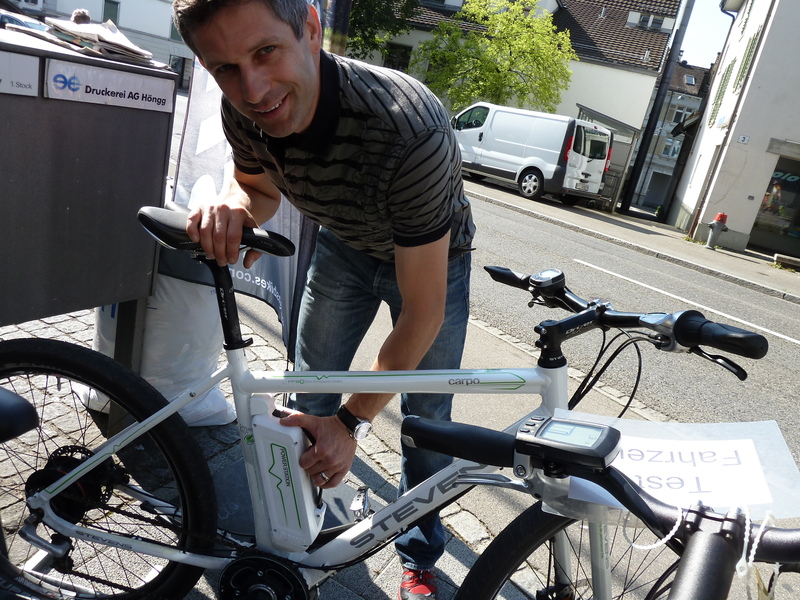 The first e-bike I tried out was called Carpo and is made by a German company called Stevens. Lucas gave me about 5 minutes of instruction before I took off. E-bikes are basically the same as normal bikes except that you get to select how much assistance you want. The more you work, the longer the battery lasts, thus giving you a longer range. The Carpo has three modes of assistance—speed, standard, and eco. Speed provides the most assistance and eco just barely helps you out. Within these assistance modes you can select a level between 1 and 3 to help you find the balance you want between assistance and effort. So, you essentially have nine different levels of assistance you can choose from. If you are in the speed mode at level 3 you will run through the battery pretty quickly and your range will only be 42 kilometers. 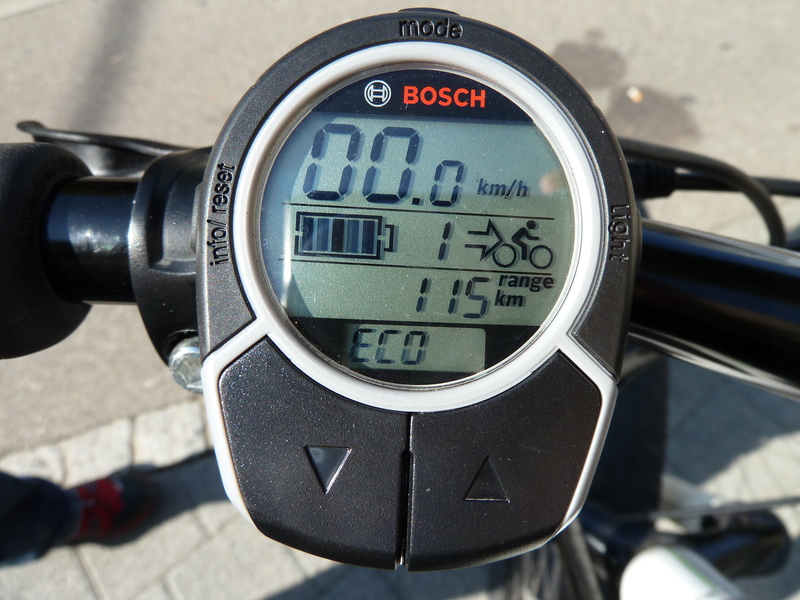 If you are in the eco mode at level 1 the battery will have a 115 kilometer range. The bike also has a fancy gearing system called a continuously variable transmission which basically makes shifting from an easy gear to a hard gear super smooth. In fact, it might mean there aren’t any gears at all—I’m not totally sure about the mechanics of how the shifting works, but it was nice and I could shift in the middle of a steep hill and the bike didn’t make any funny noises like my Kona usually does. Once I got out on the e-bike I immediately went into speed 3 and tried to go as fast as I could and up as many hills as possible. The day before I’d biked all over the same neighborhood and got quite sweaty going up some of the steeper hills. The e-bike—even on a hot day—allowed me to stay cool and I didn’t sweat at all. 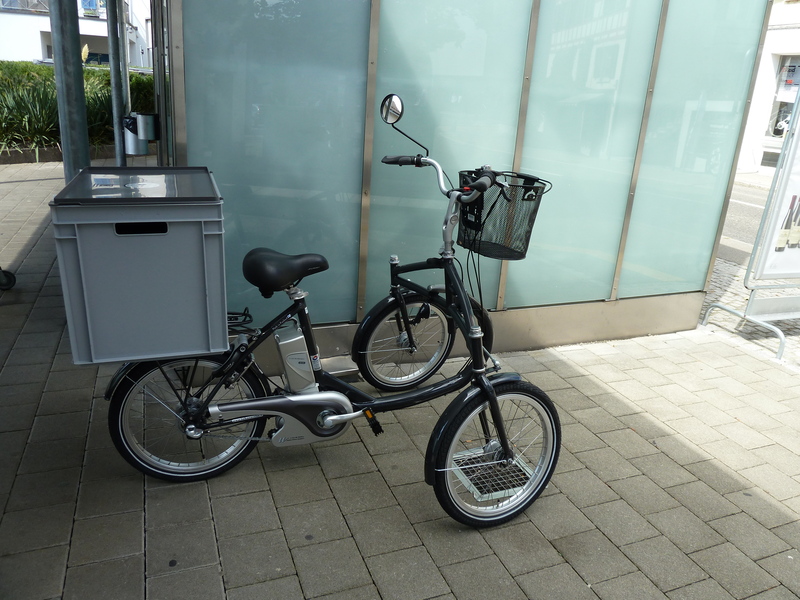 The power of the e-bike was nothing like riding a motorbike or motorcycle. I was still in control and if my pedaling slowed the bike would too. E-bikes only provide power if you are pedaling. 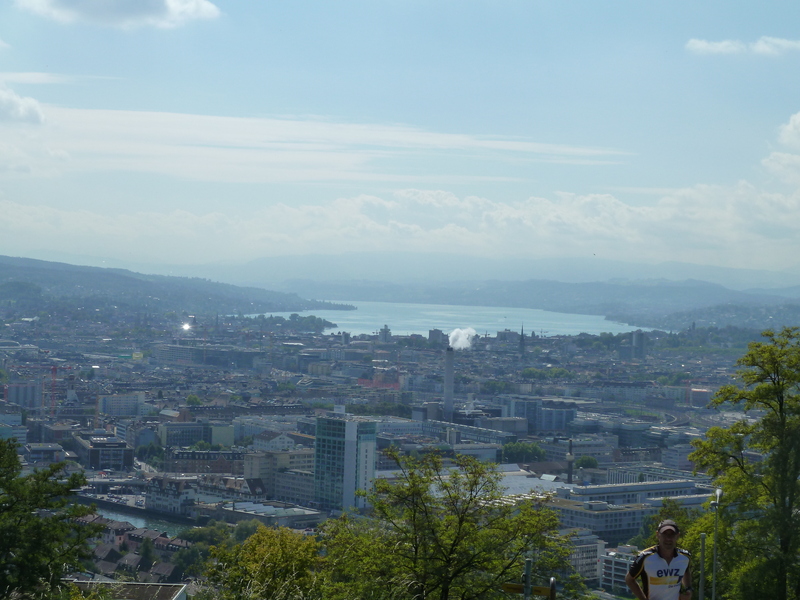 I made it to the neighborhoods perched over Zürich quickly and got some great views of Lake Zürich and the Alps. Then I biked around in eco 1 mode on some flat trails for about half an hour and—although I could definitely feel the assistance—I started to get thirsty and hungry. I didn’t bring any water or snacks with me because I assumed that I’d be exerting almost no energy since I was going to be on an e-bike, but when I got back to 2Rad I felt like I had just come back from a brisk, long walk. It wasn’t much exercise for me, but it was something. I grabbed some water and then tried out a Flyer e-bike. Flyer is a Swiss company and all their bikes are manufactured in Switzerland. The Flyer model I tested out assists to up to 45 km/hr whereas the Stevens model I tried out only provided assistance up to 27 km/hr. 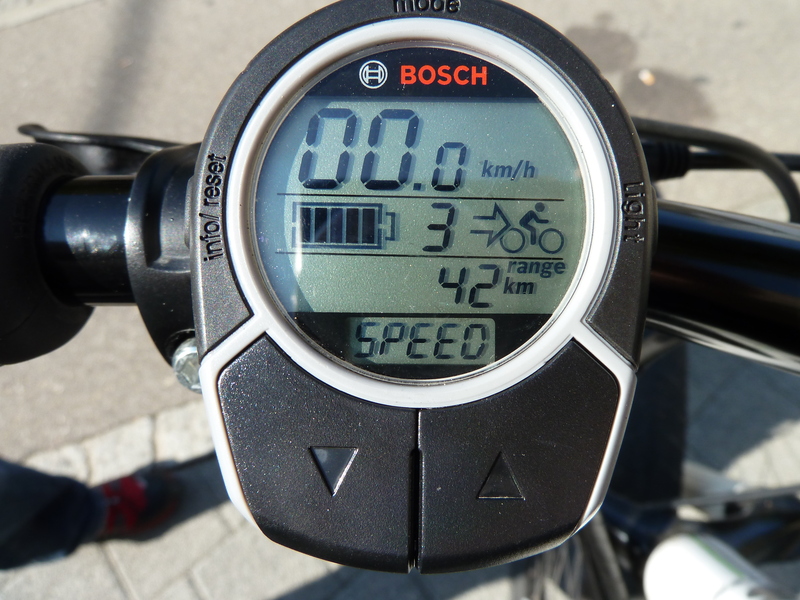 E-bikes in Zurich that exceed 30 km/hr need to be registered and licensed. The fee is 75 francs per year. I hit about 38 km/hr on the Flyer while going on a flat and couldn’t help grinning because it felt so strange to be going that fast on a bike without working harder. I also couldn’t help thinking about the times I’ve been running late while going somewhere on a bike and how it would be nice to flip on the assistance at those times. The battery does add extra weight (2-3 kg) and you need to remember to charge the battery. 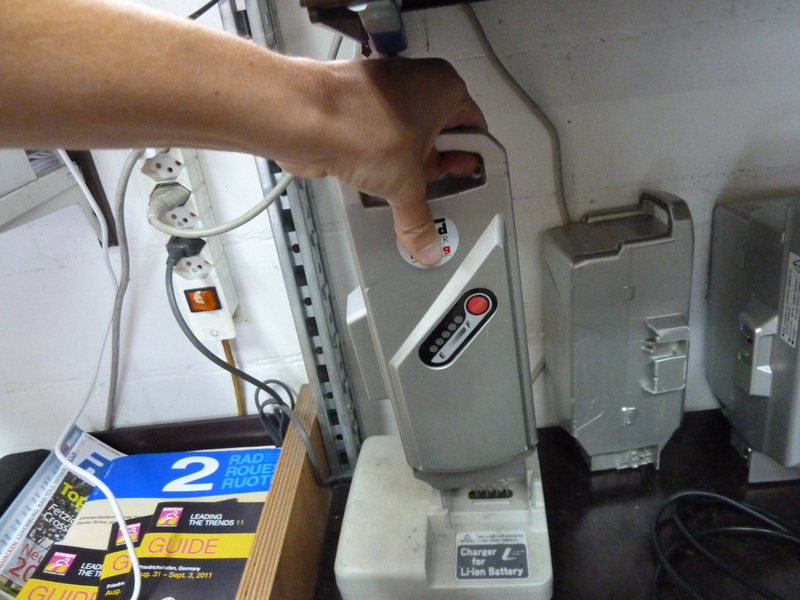 The battery charger reminded me of a Dustbuster charger. Do people have Dustbusters anymore? The amount of electricity it takes to charge an e-bike battery so that you can go 100 km is equivalent to the amount of electricity required to take a three-minute hot shower. The efficiency of e-bikes in terms of gasoline use compared to other modes of transport is also pretty compelling. I explored Zürich for another 15 minutes on the Flyer and then Lucas and I grabbed some lunch together so I could learn a little more about his business. His main customers are parents who want to pull chariots or push cargo bikes up the Zürich hills, senior citizens, and people who want to stop driving but feel their commute is too long or hilly to manage on a normal bike. Lucas and I bumped into one of his customers at the grocery store while we were getting lunch and she showed me her bike. She is disabled so Lucas built her a custom e-bike with three wheels so that she is very stable and he also added an extra-wide cargo container that her cane can fit into. It’s a pretty cool bike. E-bikes make cycling accessible to people who might otherwise be dependent on cars or public transportation. E-bikes can also give people their health back. Patients recovering from heart attacks or severely overweight people may feel a sense of helplessness as they face the daunting challenge of getting back in shape and shedding weight. 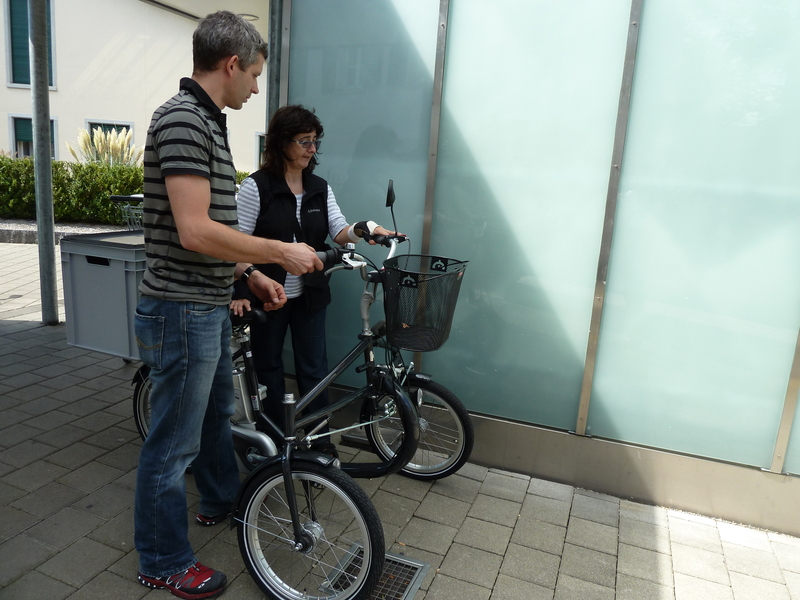 E-bikes provide a gentle and enjoyable introduction to physical activity. Passionate cyclists—like Rob—even have lifestyle changes (i.e., kids) that would make e-bikes worthwhile so that the bike “minivan” is better suited to the Seattle topography. Although I really enjoyed testing the e-bikes out, I’m happy to huff it up hills for now. That said, as I enter into other stages of my life—or if I had a very long and hilly commute—I’d consider getting an e-bike if it meant that I could continue riding my bike every day. 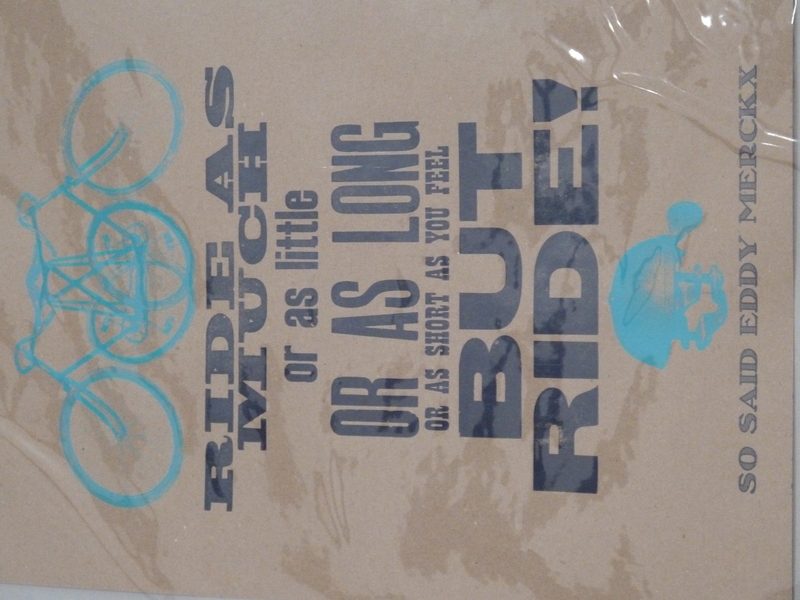 The most important thing is to keep riding! They should add "or on an electric assist bike" to this poster. More soon. I promise. Hope Labor Day was relaxing and sunny! It’s raining very hard here in London; in fact, the basement of the hostel I’m staying at is flooding currently. Perfect writing weather! Glad the wifi works on the 1st floor! P.S. Reudi and Birgitta–Thank you for spoiling me while I was in Zürich. You helped make my time in Switzerland so special! Tell Preston I miss him. 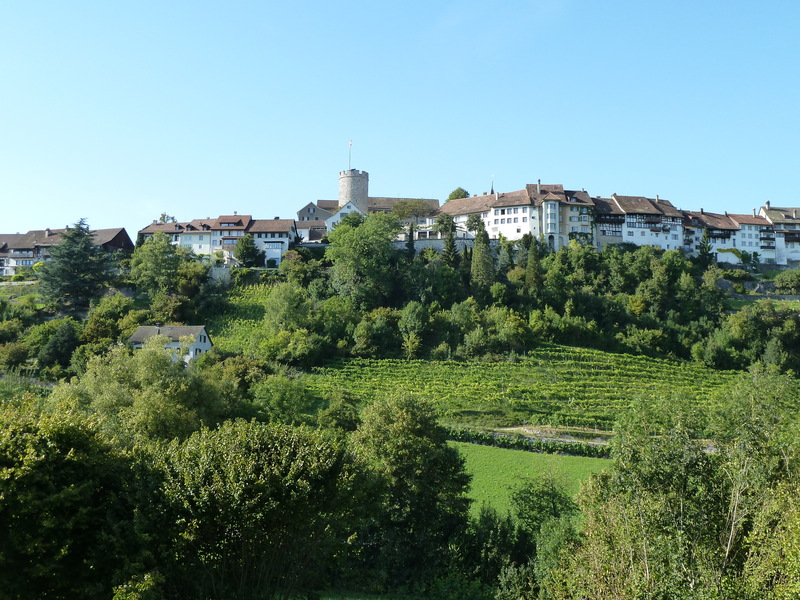 Brigitta and I went on a ride to a small town outside of Zurich--so beautiful! I was just catching up on your adventures and low and behold a post about me?!? Sounds like you are having the adventure of a lifetime. We ended up selling the Madsen bucket bike, but still have the Xtracycle cargo bike. We tried a friend’s Madsen with electric assist, but it wasn’t enough power to get up our hill.